RadSlideView has several properties which you can use to customize its appearance and behavior. This article lists them briefly. ShowIndicators: This property sets the visibility of the indicators. You can hide them by setting it to False. IndicatorColor: This property sets the color of the indicators except the selected one. SelectedIndicatorColor: This property sets the color of the selected indicator. IndicatorsSpacing: This property sets the spacing between the indicators. 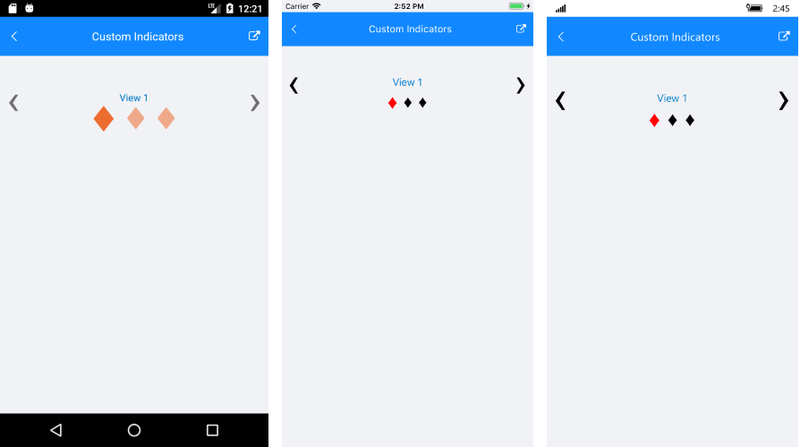 ShowButtons: This property sets the buttons visibility. You can hide them by setting it to False. SlideButtonsColor: This property sets the buttons color. SlideButtonsSize: This property sets the buttons size. VerticalContentOptions: This property sets the vertical alignment. HorizontalContentOptions and VerticalContentOptions are respected only when there isn't ContentView or Template defined. In other cases, you would need to handle the content alignment inside the View/Template respectively. The control supports a built-in sliding animation which is enabled by default. To disable it you can set the control's IsAnimated property to False. You can disable the swiping and allow the end user to change the view only with the slide buttons. To do this set the IsSwipingEnabled property to False. By default when you reach to the last view, the 'next' slide button won't do anything. You can alter this and allow repeating of the views when you reach the last view, via the IsInfiniteScrollingEnabled property. You change the orientation of the slide animation via the Orientation property of RadSlideView.